This seems to be the most professionally looking and working service that pays you to visit websites from the ones we have checked out (not only the listed here), both in terms of look and features. It offers more advanced options to advertisers such as to have a unique campaigns that can be visited only once by user or that can be revisited again in 24 hours as well as more advanced stats. As a user you need to make a minimum of 0.00005000 BTC before you request what you have earned to be sent to you and with the currently available 22 campaigns we’ve managed to earn 6000 satoshi in less than 20 minutes and send a request to withdraw them. With the number of sites available for revisiting in 1 day however you may not be able to earn enough to withdraw them again in 24 hours, but that of course depends on the number of advertisers. The revisitable campaigns available paid about 200-400 satoshi per visit and each campaign needs to be viewed between 10 and 60 seconds before you can continue to the next one – the longer the time the more you will be paid and the advertiser charged for your visit. Have in mind that with this service you need to sign a message with your wallet address to verify your account before you can request a cashout – you need an online BTC wallet or local Bitcoin wallet to do that and that can be a bit of a problem for some users that are not too familiar with Bitcoin. Another good get paid to click service for visiting advertisers crypto oriented websites, you need to do a quick registration to be able to start visiting ads and getting paid. The standard pay per click rate is 129 satoshi for 10 second visit, though the actual amount you earn can vary – higher or lower depending on ad and the time you need to spend on the advertiser website. This service has an interesting option that allows you to pay for premium membership to double your earnings for 3, 6 or 12 months, something we have not seen elsewhere. To withdraw your earnings you need to get a minimum of 1000 satoshi and do it to a Xapo wallet (if you don’t have one yet, you can make a new wallet and you will also get a bonus of 0.00005 free BTC in it), or a minimum of 10000 satoshi to withdraw direct to your BTC address (there is 1.5% fee for direct withdraws). In about 10 minutes we were able to visit all of the available ads and earn about 3500 satoshi, so it was a quick and easy to do it and we were able to request a withdraw. There seems to be new ads appearing all of the time, so no need to revisit every 24 hours, you can check it more often to get more offers to click on. For advertisers there is no need to register on the website, you can advertise for a minimum of 397 satoshi per visitor for 10 second visit, up to 200 seconds for 2658 per visitor, ads are apparently approved very fast after payment. An easier to be used and less advanced in terms of features service as compared to the one above that will get you on the track of getting paid for visiting websites faster. Here you get paid between 30 and 200 satoshi per visited website depending on the time you need to spend before going to the next website (10 to 60 seconds per website). The minimum amount you need to get before you can get paid is 0.00005825 BTC and it took us a bit over an hour to reach that amount and be on the track to get paid. The service relies on Microwallet for the transactions and there is a small fee that you will be charged by that additional service for the payment. What we don’t like however is that you don’t get information on how much you have collected so far and how much each website will earn you directly, you need to go to microwallet’s website to check your current balance using the same wallet address on both sites. If you are interested in advertising on the service you can get a visitor for as low as 100 satoshi for a 10 second limit on the visit. There seem to be quite a lot of campaigns so you can continue earning by visiting websites for quite a while if you have the time. 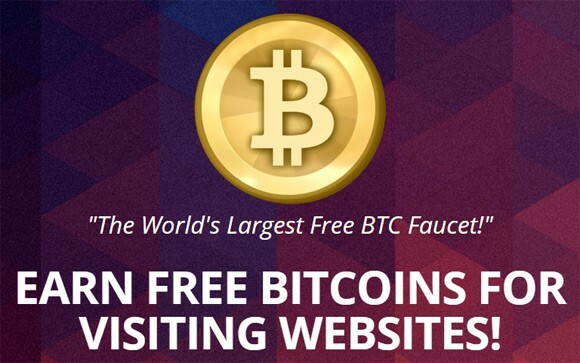 A simple to use pay to visit websites service giving you Bitcoins in return that can get you stared quickly on your way to earn some free BTC, but we don’t like very much the way what you are getting paid for each visit is realized and the time you need to spend before you can visit another website. The first one to two websites can reward you with a few hundred satoshi for the visit, but then each next visit lowers the value and you quickly get below 100 and going down to 10. In 24 hours you can “start again” with a higher payout and go to lower again, but what makes it even worse for the visitor not being able to earn that much per day is the fact that you need to stay 5 minutes on a website before you can go to the next one. In order to get paid you need to meet a minimum of 6000 satoshi, but in two days we have managed to reach just about 4000 satoshi, we of course gave up visiting websites when the payment goes too low. This on the other hand is good for advertisers who want to have some crypto users who will have enough time to look at the websites they visit with just 100 satoshi as a minimum bid for a visitor. A typical service paying in Bitcoin you to visit advertiser websites, what is interesting here though is that you are being paid 1437 satoshi per visit or so it may seem at first as the website uses one more zero for the balances than is typically supported by Bitcoin. So in reality you are being paid 143.7 satoshi for a 30 second visit per site. There is also another catch, with the number of ads currently available you will be able to earn a bit less than 5 thousand satoshi in about 30 minutes, but you need to earn at least 10000 to be able to request a payout. So in two days it might be possible to make about 0.0001 BTC and that does not seem as good a you might’ve though initially, still you might want to give it a try, though it seems the ads are based on unique visits only and not resurfable. If you want to advertise your crypto website on the service you can do so at a price of 287.3 satoshi per visitor as apparently half of that amount goes as payment to the visitors, the ads are automatically approved and you start getting visits after the payment is confirmed. One more PTC (Paid-To-Click) service where you get paid in Bitcoins (BTC) to view sites. The service gives you 500 satoshi just for signing up and starting to use it. There is 15000 satoshi as a minimum withdraw amount and in less than 5 minutes we’ve managed to collect a total of just 1320 satoshi with the reason for the small amount being that there are not that many ads available to click on. If you want to advertise you can do it at at 404 satoshi per visitor for 10 second visit, up to 200 seconds at higher price option available. The ads are automatically approved after the payment is confirmed. Now, for some general conclusions about the services above and other similar ones. As you can see the minimum amount of BTC you need to collect before it can be sent to your wallet is hovering around 6000 satoshi or 0.00006000 BTC. This may not seem very little if you are looking it this way, but if you convert that amount to USD with the current exchange rate for BTC you will get something like just $0.015 USD, yes, this is 1.5 US cents. Spending like 20 minutes as an experiment to get back this may seem OK, even an hour once may still be acceptable as an experience trying things out, but doing it day after day seems really pointless and still a lot of people do seem to be doing it. So the ones that actually make money are the service operators of such websites and the advertisers that get cheap targeted traffic to their websites.